WASHINGTON (CNN) - A.B. Culvahouse, the attorney tasked with leading the vetting process for Republican presidential nominee John McCain's running mate, said Friday that he thoroughly scrutinized Alaska Gov. Sarah Palin and said that he "came away impressed." McCain's vetting process came under scrutiny after numerous surprises about Palin popped up in the weeks after she was tapped as his vice presidential pick. Culvahouse said he and his team of 30 lawyers knew everything, including the fact that her teenage daughter was pregnant. He suggested that the campaign staff that talked to the media may not have been fully informed, which "led to the impression that those issues had been withheld." "Gov. Palin told us everything. Everything except the pregnancy of her daughter was on a response to the written questionnaire," Culvahouse said Friday at a Republican National Lawyers Association National Policy Conference. "She told me there was one issue she wanted to talk about when we went in for the interview. We knew everything going in." Culvahouse said they started with 26 candidates who didn't know they were under consideration. Once the list was narrowed down to six, each person was given a survey with 74 questions, which he said included specific questions, like "have you ever been unfaithful," but not "what the meaning of is, is." "Me and two of my most cynical partners interviewed her and we came away impressed," Culvahouse said of his interview with Palin. "I think she would've made a great vice president." He said he gave her three "leading" questions, asking if she was prepared to use nuclear weapons, why she wanted to be vice president, and if the CIA located Osama bin Laden, but shooting him would result in civilian casualties, what would she do. Culvahouse said she "knocked those three questions out of the park." Culvahouse said McCain was the "decider," but that he was not allowed to pick anyone that had not been vetted. But when McCain asked him for the "bottom line" on Palin, Culvahouse said the Republican nominee liked the "risk" involved. "I said, John, high risk, high reward," Culvahouse said. "His response, you shouldn't have told me that. I've been a risk-taker all my life." What a shock that the vetter says he was right. Useless article. Which Will Become Extinct First? Elephants or Rotting on the Vine Rushpublicans? That makes the pick even more idiotic than the candidate herself. The only thing this woman could ever hit out of the park is a lie or exaggeration about her "qualifications". It was a Hail-Mary desperation move. It was an effort to bamboozle the public. In short, it was a fraud, but that shouldn't surprise anyone who sees republican disinformation flow from their organ, Fox News, every day. They knew she wasn't even remotely qualified. They did it anyway, to hell with the well being of our country! "Country First" was a laughable fraud. Choosing a high risk/high reward VP candidate is not a very smart thing for someone whith so many medical conditions. It was completely wreckless and America knew it. On top of that, Republicans are far to inclusive of a party to stay relevant with the new generation. This whole two party system needs to be scrapped if you ask me. The Republicans will have to restructure their party for them to have any chance of winning the 2012 election. Palin is imploding in Alaska. They'll have to come up with a more centralist candidate. They need to keep in mind that we'll have 4 yrs of new young voters and 4 yrs less of retirees who are typically Republican. Should be interesting. Culvahouse was hoping for the Hillary voters. Dumb move on his part. "...you shouldn't have told me that. I've been a risk-taker all my life." Which is why, Mr. McCain, you were unsuitable to be the CEO of the USA. The presidency is not a crap game. 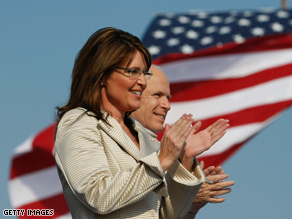 picking palin cost mccain the election. obama may have still won but not by a landslide. republicans, known to me, voted for obama and donated to his campaign soon after mccain announced palin as his running mate and palin revealed herself to be an airhead. even NRA members, known to me, voted for obama fearing palin would be potus in the event of mccain's death since mccain presented very old. "High-Risk, High-Reward" vs. "No Drama Obama"
As if we needed any further evidence that America made the right choice last November. Thank Goodness! This is a joke, just like Palin. Well what a deal. I am just delighted that they brought each other down. Old was bad but far right was worse....What a duo and the vetter should never vet again! It was a high reward...Obama won! Was Culvahouse paid for this great service to the country, or did he do it out of the goodness of his heart? Thank you, Mr. Culvahouse and your "most cynical lawyers" for being so easily impressed. Had you not been so impressionable, we might have ended up with President McCain. Anyone listening to Palin's speech at the Republican convention who came away "impressed" should seek serious psychological help. The most amazing and unbelievable thing is that there still are people (and media types) who are still talking about Palin "running for president. "Even the crude Polish jokes eventually came to an end. Please! How is this relevant? The people didn't want her as V.P. What makes you think they'd want her as president? High Risk, NO REWARD. So glad you chose her guys, she helped ruin any small hope you had of winning the election. She would have been an awful Vice President and a stupid President if that need had arisen. I liked John McCain's views however I felt he was too old and did worry about his temper. I liked Obama's charisma but didn't like 95% of his views. I despised Biden. While he did a better job in the vice president debate he was wrong on so many of his facts. He did sound better presenting his bad facts than Palin though. I fell in love with Pailin from the first time I heard she was selected. And while I still really like her voting record and her views she came off badly in the debate and in several interviews. I think between being "handled" by what the staff thought everyone wanted to see and the bad press she got it hurt her image quite a bit. The press still to this day likes to rag on her. I do wish her the best and would still vote for her anytime but she will have one heck of a hard time changing peoples minds. She's been giving a stigma by the press before people really got to know her. And that why people who actually know and have sat down for a real conversation with her really like her. And those that just run around believing what they read is truth don't. This is the most ridiculous spin I have ever read. "...we came away impressed." OH PLEASE. The woman can't utter one grammatically correct sentence. She didn't even know what the VP does, so her answer was not only not impressive, it was most likely incorrect. I'd like to know what knocking "those three questions out of the park" means. I am very please with the President and Vice-President I have now.